Fast, Easy and Affordable PDH Continuing Education for Engineers! This course provides the basic concepts of cathodic protection, together with important criteria and precautions to be observed. Corrosion of metals is a result of electrochemical reactions. An electrochemical reaction is a chemical reaction accompanied by a flow of electrical current. The driving force for the corrosion of metals through electrochemical reactions is the free energy of the metal atoms in their metallic form. All chemical systems tend to change so that the free energy present is at a minimum. This is analogous to the flow of water downhill to minimize the free energy due to gravity. Most engineering metals are found in nature in a form with low free energy. These metal ores are chemical compounds consisting of the metal atoms combined with other atoms such as oxygen or sulfur. The process of breaking up these ores into their metallic and non-metallic atoms involves an addition of energy in order to free the metal atoms from the natural, low energy content chemical compounds. The corrosion process is driven by the tendency of these metal atoms to revert to their natural state. If corrosion products are analyzed, their chemical composition is usually identical to the ore from which the metal was originally obtained. Learn about anode materials and where they are applicable. This course is intended for civil, mechanical, electrical and geotechnical engineers and other design and construction professionals wanting an introduction to the concepts underlying cathodic protection, criteria for successful implementation, and specific cautionary notes. This course will give professional engineers and other design and construction professionals an introduction to the fundamentals of galvanic and impressed current cathodic protection systems. 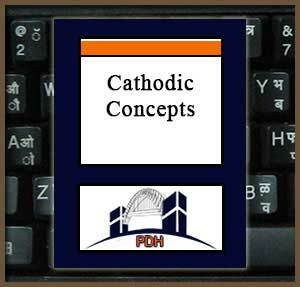 This is an introduction to methods of cathodic protection for various infrastructure applications. This course will give you guidance you can apply to corrosion protection requirements for a variety of infrastructure projects. If you see "invalid token" please hold down ctrl on your keyboard and click the refresh button (an arrow going in a circle two buttons to the right of your "back" button). Wow, an email from a real person and not a pre-written response. That is very refreshing. I will be sure to recommend this site to others in my field! Thank you for your quick response. I can take unlimited courses for up to one year? That means I can apply some of the courses for this year’s deadline, and take additional courses after that toward my next period deadline!